“Down syndrome has to disappear from society,” according to Hans Galjaard, in a recent interview about the new genetic blood-screen NIPT. In his “opinion” he does not take into account the fact that people with Down syndrome judge life better than you and I. Now, the UK government proposed the accurate NIPT be implemented to the NHS screening program. Professor Galjaard is an influential geneticist and former Unesco member who, on behalf of the United Nations has advised countries all over the world on prenatal screening. Ideas like his have shaped national prenatal screening programs worldwide. Most Western countries have national prenatal screening programs that single out Down syndrome as a “free choice” for parents. These national screening programs are not aimed at detecting gender, or genes for sexual preference or transgender. That would (rightfully) send the wrong message to society that they would not be equally valued. Children with Down syndrome need more attention, on average. And that costs money, and effort. And health-care is expensive enough as it is. It puts extra pressure on families and society parents are reminded. Meanwhile nobody discusses what it means to a woman when she aborts her pregnancy mid-term and delivers a dead baby. Nobody mentions the mental and emotional struggle she faces in knowing she played a role in her unborn childs death. The emptiness she feels and cannot explain to her husband. The gap that often starts growing in her relationship or her mother instinct that is absent in a subsequent pregnancy. The hurt she feels every time a happy and healthy child with Down syndrome passes her by. Magazines hail the new test as the holy grail to women’s reproductive freedom. And women ask each other: Did you get tested? And the women who don’t are asked: did you know it in advance? A question that is so much more than plain interest. Your child is “your choice.” Why does society have to put extra effort and money into your choice? And so, under the pretense of “free choice,” over 90% of women do what society expects of them. The freedom to choose has become the duty to abort. My son has two sisters with Down syndrome. He helps them with their schoolbag, they let him know they appreciate him by cuddling him to bits. A better person for it. In our family everyone is involved in all activities, even if that means we have to put in extra effort, wait a little longer or change our routine all together. Everyone is equal and everyone knows they are allowed to be who they are. Isn’t that the only choice we have as humans? 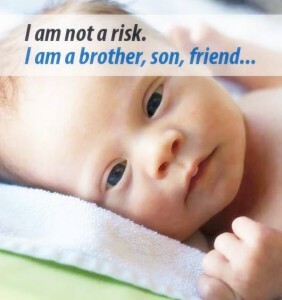 Any individual who willingly, with knowledge and forethought, brings a child to life with a disability, particularly one that will deprive them of a full, autonomous, productive life, is a criminal. It is an act of criminal selfishness to create for yourself what amounts to little more than a pet, a pet that will outlast its progenitors and rely on society to provide increasingly difficult and expensive care. Every child has THE RIGHT to the best possible start, and we are morally and socially obligated to provide it. How shameful that anyone would embrace these painful, humiliating defects. We certainly should love and support those who exist, those who are already here, but to create more? Monstrous, truly. You must be mistaken, we are talking about people with Down syndrome in this article. Ana. What an uneducated and frankly offensive comment you have made. One can only assume you are a troll intent on provoking reaction, and for that reason I am not going to remark further. You are clearly a buffoon of the highest order. Good luck to you. Ana, please feel free to come and meet my daughter and see the fulfilled, amazing, happy, independent life she leads. She lives in her own home, has a job and gives back to society so much in the fun and joy she brings to so many people. At night she can sleep with a good conscience of a day spent usefully unlike you who clearly have no heart or conscience. oh I forgot to mention she is only 20 – not many 20 year olds can achieve that! A shocking response from Ana, but I find it’s more common an attitude than we’d care to believe in our society. Who’s to say someone with DS isn’t happy or being a productive member of society? There are mentally capable people that drain society FAR more than the person (PERSON) with DS who lives on their own and works a regular job. My question to someone like Ana: who decides what a “full” life is? Where do we draw the line? You come dangerously close to the ideas behind eugenics with that attitude. I’ve found our society still generally thinks it’s okay to be prejudiced against people with DS. We’ve come a long way when it comes to race and sexuality (and still have a long way to go), but it still seems like a lot of people are in the stone age regarding DS. I am Deafblind but I’ve met people with Downs Syndrome and feel very strongly that people with downs syndrome and every other disablity should be given a chance of life. I find it very upsetting that abortions take place so late in pregnancy. Particularly when they were aborted long past the age when a fetus can feel pain and can feel when it’s been ripped out of the womb. What a terrible end to such an innocent life. Shortly after I reached my second trimester of pregnancy our baby’s heartbeat was gone. We got the results afterwards that he was a boy with Down Syndrome. We would have loved him so much and we never would have selectively terminated. My fiancé manages a group home for adults with developmental disabilities (we actually live here as live-in staff) and I’m finishing school to teach special education. People with developmental disabilities are so misunderstood. Before people like Ana go around saying they must be eliminated, I dare you to spend a day working with these people. I dare you to volunteer with special needs kids. Neurodiversity is a beautiful thing that benefits sociey in more ways than meets the eye.